Tube paints makers producted usually contain not only pigment and binder but also many kinds of additives, such as inert pigments, dryers, stabilizers or etc. These additives may not necessarily be good for traditional painting method. And most of makers use low-priced materials. Even if they use high-class materials, they have many restrictions. They have to supply paints which can be stock at painting material shops for long time. 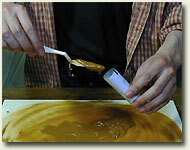 If you are not satisfied with makers' tube paints, you can grind your own oil paint. You can choose binders , pigments or additives you like. 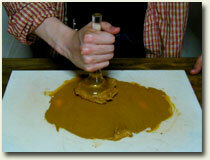 This page teaches you how to grind pigment and binder to make your own oil paint. Some pigments are poisonous. Be careful about health hazard when you treat pigments. When you put pigments on the grinding slab and start to grind them , pigments fly easily and you will probably take them with your breath. If you are worry , you can mix pigments and binders in a stainless steel bowl by a rubber spatula at first ( Do not add too much binder ) , and then move it on the grinding slab to grind. In this way, pigments do not fly so much. Cadmium red , vermilion , silver white , cobalt blue and etc. are known as poisonous pigment . See "the pigment table" to check first. You will need the following materials and tools. About Binder , you can use every kind of drying oil you like. 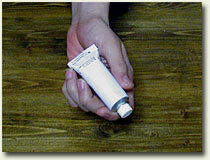 Read the explanation of "Drying oil" on this site to get knowledge of drying oils. In genaral, Cold-Pressed Linseed oil is known as a good binder for grinding pigments because of its mobility. Stand oil and Sun-thickened oil are known by their fastness. And you can also make your own original binder ( see Houw to make your own madium ). You can use a Marble Palette or Glass Palette as Grinding srab. You may get them at the largest shop in your city or the shop specialized to traditional art material. The time of grinding depends on each pigments. They say longer is better. But some pigments, such as white lead oxidize comparatively fast. In general, 30 minutes is bester. And the amount of binder depends on each pigments, too. Data of them you get when you grind is orecious , so you should record them. Put pigments on the Grinding srab and add the binder. Mix them by a spatula or Palette knife. Start to grind by the Muller. it'll be like paint little by little. Gather up the paint by a spatula. And grind them again. The paint may get a gloss and mobility. After grinding enough, pack them into a empty tube by a palette knife. Post the label written dwon its recipe and date. Copyright(C)1999-2002 Norihiro Matsukawa, All Rights Reserved.